Whether people in Los Angeles know it, these two franchises will forever be linked. As many of you younger Mets fans (I can still call myself that, right? ), many of our fathers grew up as a Brooklyn Dodger fan. They became Mets fans because the Dodgers left town. The Mets came into existence as a result of the Dodgers moving from Brooklyn. The Mets owners won’t quite let the Dodgers go. The teams have also shared stars. You know what’s insane about that play? You know other than it happened. Former Dodger Shawn Green relayed the ball to former Dodger Jose Valentin, who threw the ball to former Dodger Paul Lo Duca. The first runner tagged out was former Met Jeff Kent. It seems that J.D. Drew wasn’t supposed to be part of this play at all. In any event, rather than go on about how much I hate the Dodgers (don’t worry, that’s coming tomorrow) I thought it would be fun to name the best players who have played for the Mets and Dodgers. Honestly, I thought this team would be better. The main problem was the derth of left fielders. Another problem was someone like Zeile. He played 3B for the Dodgers, but he mostly played 1B for the Mets. As you can tell, I leaned towards the player who was better as a Mets. If there are any suggestions, I’ll be happy to update this list. As we know, the Dodgers and Mets have a complicated history. The next chapter begins tomorrow night. Lets Go Mets! Yesterday, the problem was finding out who to pick for 14 in this series with the paucity of choices. Today’s selection was an abundance of good choices. There was Roberto Alomar‘s disappointing tenure. I’m sure there are Mets fans that would’ve picked Willie Randolph, but he was decent with the Mets in the last year of a good career. Furthermore, I was higher on him as a manager than most people. I remember that Jeff Kent was hated by Mets fans, except the ones in my household. Espinoza was not a great major league player, but truth be told, he was at his best in those 48 games with the Mets. So, why pick him? He was part of a trade that ditched a possible Hall of Fame second baseman for a player fading fast in Baerga. Neither player was of much help, especially in a 1996 season when the Mets finished 71-91. Baerga’s numbers dropped steadily his three years in New York, and he couldn’t stay on second base. He would be gone before the glory years of 1999 and 2000, but you know who would reappear in 2000? Vizcaino. The man who put an end to Game 1 of the 2000 World Series. He was in that position due to Timo Perez‘s lack of hustle and Armando Benitez once again caving in from the pressure. So I picked Esponiza more as a symbolic gesture as a reminder that the trade for the star usually doesn’t work in the Mets history. I think that reminder is quite aprospros this season. 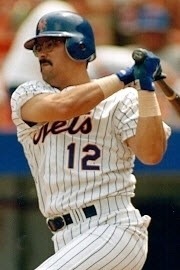 With that in mind, please join me in offering a hat tip to Magic Number 12, Alvaro Espinoza.